It would be immensely hard for me to pick a favorite restaurant in this great city, or a favorite recipe that I make. My tastes ebb and change with the seasons and moods and other factors. 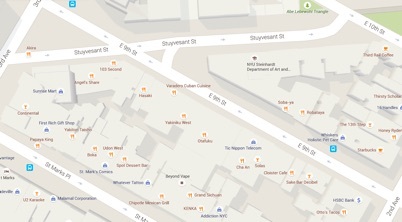 However, if someone asked me to pick a favorite street for food in New York City, that I could do easily. The stretch of East 9th between 2nd and 3rd has long been home to a vast and diverse array of Japanese eat-and-drink-eries that have a special place in my heart. Sobaya for noodles, Decibel for sake, Hasaki for sushi, Village Yokocho for izakaya food...all, surprisingly, part of a mini-empire owned by a guy named Bon Yagi, and close to a number of my other favorite Japanese places, and the source of many happy food memories. Which are now joined by a new one as Otafuku, the venerable, tiny, takoyaki stand on 9th Street has expanded to larger, fancier digs and added taiyaki capabilities as well! 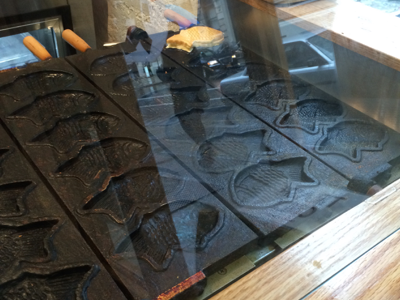 Taiyaki is, like many Japanese things, easy and difficult to explain at the same time. It’s basically a baked, stuffed waffle or donut, dough cooked around something sweet (bean paste, custard, chocolate...), and shaped like a sea bream, or tai. Why a fish? Well, there’s a homophone in Japanese between “tai” the fish, and “medetai,” which means to celebrate. And these yummy pastries, which you find in Japan at fairs and what-not, are wonderful--served warm from the taiyaki iron, they always make me happy. Not that run-of-the-mill non-fish-shaped donuts don’t make me happy, but the fish-ness of them is an added bonus. So, anyway, I was in the neighborhood today and I finally stopped by and got myself a taiyaki as a treat. And instantly I was a junior in college again, in Kyoto for my year abroad, and every day full of new things to explore and experience. Not all of them as sweet as taiyaki, but still. A memory worth celebrating.